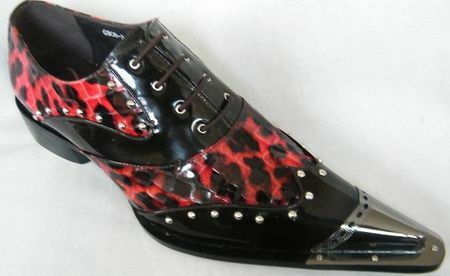 Zota shoes have that night club attitude made for being the king of the night time world. With impossible not to stare at style that are designed in Italy. These shoes will really get the heads turning your way. These burgundy red print shoes feature a pointy toe style with studs and a metal tip that you know you are on the cutting edge of style. You will look great wearing these either with fancy jeans or wide leg pants.